A 2017 Smith River float trip with Lewis & Clark Expeditions is a great reason to call 406-459-2030 and talk to Mike Geary, today. 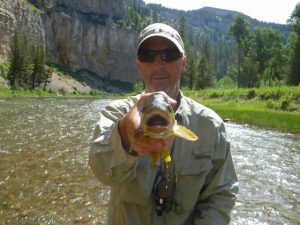 Mike is the largest fly fishing outfitter on the Smith and has great trip dates available to reserve. Five days and four nights down 59 river miles is a trip that you will remember forever. Pictured, Smith River guide John Howard, a testament to great fly fishing on the Smith.